Sooner or later, every quilter begins to suspect that fabric scraps multiply like proverbial rabbits. We don't know how or why they do it, we only know that after a project that was supposed to use up our scraps is finished, we end up with yet another bucket of scraps. It's like fabric scraps are impossible to eradicate. They multiply faster than we can sew them up! After studying this phenomenon, I think I've found two methods of fabric reproduction. Remember high school biology class? Cells can multiply by splitting apart into two cells, a process called mitosis. Whenever we apply scissors or rotary cutter to fabric, we're basically causing that one piece of fabric to become two: fabric mitosis. Let's start with a yard of fabric. We cut it in half, and then we cut each half into half to create four Fat Quarters measuring 18" x 21". One piece has now become four pieces of fabric. Now let's cut FQ #1 into 5-inch charms. 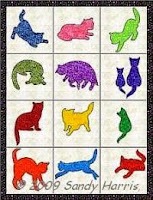 We get 12 charms plus one 1" x 18" strip and four 3" x 5" scraps for a total of 17 fabric pieces. We'll cut FQ #2 into 6.5" squares for a block swap. We get six squares plus a 1.5" x 18" strip and three 5" x 6.5" pieces for the scrap bucket. Total: 10 pieces of fabric. That 4-patch baby quilt needs more 4.5" squares, so we cut FQ #3 into 16 squares and get a 3" x 18" strip leftover, making 17 pieces total. Nearly every project needs half-square triangle units, right? So we cut FQ #4 into 43 3" squares. Assuming our FQ really is 18" x 21", we have no leftover scraps of fabric. Wow! After all that cutting, we have a grand total of 86 pieces of fabric! Ten of those pieces got tossed in the scrap bucket. We dig into the bucket and trim the four 3" x 5" pieces to 3" x 3" squares for the HST pile, but we still have four 2" x 3" scraps that go back in the bucket. Project pieces 80, scrap pieces 10. Now we cut the three 5" x 6.5" scraps into three 4.5" squares for the 4-patch project. We toss the three half-inch slivers in the trash can (I have a 1" minimum rule), but we still have three 2.5" x 5" scraps. Project pieces 83, scrap pieces 10. Only one large scrap left! We cut the 3" x 18" strip into six 3" squares - no scraps leftover. Project pieces 89, scrap pieces 9. Nine scraps from a yard of fabric isn't bad, but eventually we'll have to cut those two long, skinny strips into several pieces to make string blocks. The other seven scraps will sit in the scrap bucket waiting with all the other scraps for just the right project as they get buried under future scraps. I've watched enough nature documentaries to have noticed that when a young male comes of age and is outcast from the family group, that young male doesn't stay a "lone wolf" for long. Eventually he attracts at least one female and they reproduce. Fabric seems to do much the same thing, especially holiday and novelty prints. 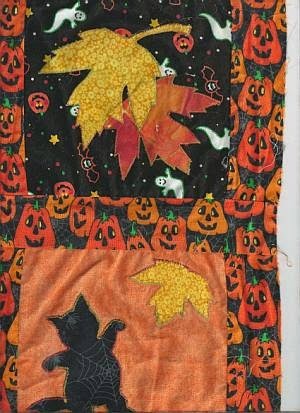 If I have only one Halloween fabric left in my stash, sooner or later I'm going to acquire at least one more in order to make a patchwork project. And then the reproduction by mitosis begins all over again. I can't do much about fabric mitosis - it's a natural part of the patchwork and applique process and we just have to accept it. But, by golly, I can do something about fabric reproduction by attraction! When I end up with large scraps of a fabric that I don't want to multiply, I use it up quick. After finishing my little Halloween wall hanging, I had two largish scraps of backing fabric left over. I did not want this fabric to attract more like it and I knew it would if I tossed the scraps into the large-scrap bucket. So I cut four small rectangles and four large rectangles, cut the leftover binding in half, foraged for a small zipper and, hocus-pocus, the scraps turned into a little zippered case and a tote bag with no scraps left over! Today didn't start out well. I awoke feeling ill again, and like a steam roller had flattened me while I slept. Nothing wanted to move. When I forced the issue, everything creaked and popped like sound effects in a scary cartoon. Is there some kind of weird initiation rite into the sixth decade of life that I wasn't warned about? My only wish after breakfast was to crawl back in bed and sleep, but I dragged myself to my sewing machine instead and started sorting and pressing the pieced units for my Sunrise, Sunset blocks that I had sewn several weeks ago. As I worked, the rhythmic pace of a repetitive task that required some degree of mental concentration seemed to ease my headache and sinus pain. I think most crafts are just as good as aspirin-like medications and don't have horrid side effects! While I was sorting, I was reminded of the value of a test block and remembered that I forgot to talk about this topic. I made a test block weeks ago for the obvious reason of seeing if I liked my chosen fabrics in this block. Colors and fabrics that look good together on paper or in software programs like Electric Quilt or Quilt Pro can look quite different in reality. A test block will show how the real fabrics play together. There are a few other good reasons for making test blocks, too. As I assemble my test blocks, I also test my pressing chart and work out any problems I may encounter. With the Sunrise, Sunset block, I quickly learned that positive/negative blocks aren't as simple as they look. Seams have to be sewn and pressed just right or a completely different design develops. Today, I found nine units that must be taken apart and resewn because the half-square triangles are going the wrong way! Test blocks also show me how fabrics will behave as they're worked with. I quickly learned that my light fabric ravels rather easily while my dark fabric doesn't ravel at all. As I sew, I'll take care to be more gentle with my light pieces. Another option is to starch the lights. I rarely use starch or sizing unless a fabric ravels so badly that it can't be used otherwise, but that's my personal preference. My last reason for making a test block is that I use it as my road map for making all the other blocks. I find it easier to refer to a real block as I work rather than a diagram on paper. It seems like every year one quilt group or another has a discussion about whether or not to prewash fabrics. There are many good reasons on both sides. At my old house where the laundry room adjoined my crafting/sewing room, I was more inclined to wash fabrics before cutting them. Now that I have to trek through the rain and mud to get to the laundry room, I only prewash when absolutely necessary and take my chances on everything working out. So far, I've been pretty lucky. But no one bats a thousand. I recently unearthed a small wall hanging UFO that had to be laundered before it could be completed (somebody's muddy paw prints!). When it came out of the dryer, I faced an unpleasant surprise: one fabric, the one I had used for sashing the blocks, had shrunk. Groan! 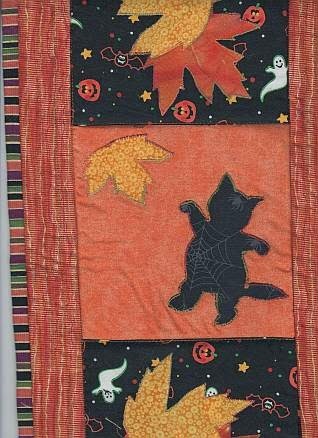 Since it's a simple seasonal wall hanging for Halloween, I debated just finishing it with puckers and all. Strategically placed quilting would have camouflaged a great deal. 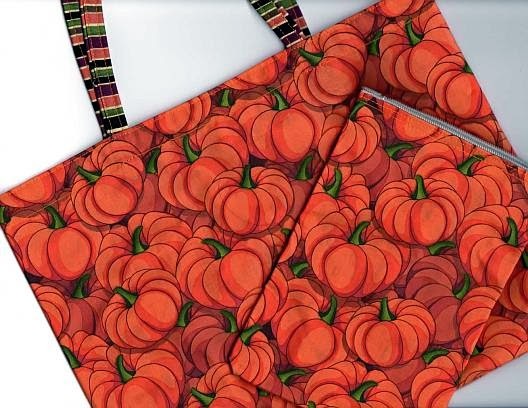 But as I studied it, I decided that I really didn't like that pumpkin fabric anymore (tastes change over the years). So I dug out a seam ripper and took everything apart while "watching" a tv show. Then I decided to take a detour from my Valentine fabric project and get this UFO finished before this Halloween. I dug through my stash for other fabric possibilities, spent several days testing this combination and that combination (while sewing heart fabric HSTs), and finally settled on two fabrics for a border and binding without any sash. If I'd had an appropriate black fabric in my stash, I think I would have added a very narrow inner black border. But I still like this look better than the original one. And I have one less UFO cluttering my studio. 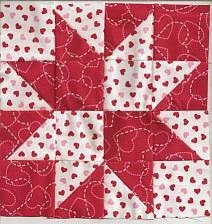 Tomorrow, it's back to work on my red and white Sunrise, Sunset blocks. I've been ill. After two rounds of antibiotics, I think my body is finally claiming victory over the infection. While combatting that, the weather changed from sunny and warm to rainy and chilly. My heaters are now on and my mom's wood stove is puffing away. I hate the smoke but I sure love the heat a wood stove puts out - there's nothing better except good ol' sunshine! Today was not rainy so we "battened down the hatches" for winter. The summer things that could fit in the storage shed were put in the storage shed. What didn't fit is now covered with tarps. Tomorrow's storm is supposed to be windy, so we'll find out soon if the tarps are secured well enough. It's time now to settle into indoor pursuits, like quilting, sewing, crocheting, knitting, embroidery, cross stitch, kumihimo and baking. Most of these endeavors keep me out of trouble during our long rainy season. The baking, however, can get me into trouble. I love to bake, but too much of that and I find myself in need of a new wardrobe! This year, however, I'll have three 15-year-old nephews (not triplets - twins and a cousin) near by who, I think, will quite happily take the baked goods off my hands so the calories won't go on my hips. I can bake all kinds of yummy treats and not gain an ounce as long as I limit myself to one little taste.